Last week, Yahoo Sports reporter Chris Haynes said the New York Knicks have a “very good shot at luring (Kevin Durant) away from the Bay Area.” Many had already speculated that the 2018-19 season may be Durant’s final as a Warrior. He has a $31.5 million player option for the 2019-20 season, meaning he could opt out after the upcoming season and enter free agency. 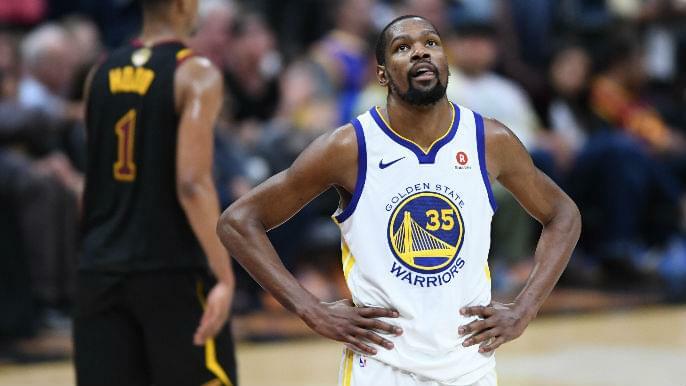 The Athletic‘s Marcus Thompson chatted with KNBR Tuesday morning and weighed in on Durant’s future with the Warriors. Thompson posed a couple questions: if the Warriors win their third straight NBA championship, is it really a challenge for Durant moving forward? What is his reason to stay? Durant’s two years with the Warriors have gone as well as anyone could have hoped. He won the past two NBA Finals MVP awards. Durant averaged 25.7 points, 7.5 rebounds, and 5.1 assists per game, while shooting 52.5 percent from the floor and 40 percent from three-point range in his two years with Golden State. Listen to the Murph and Mac podcast below. To hear Thompson talk about Durant, skip to the 9:40 mark.